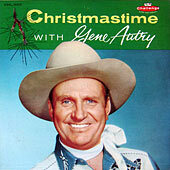 These Christmas songs come from the heart of a man who has a deep feeling for the spirit and warmth of this holiday which means so much to all of us, as we feel that CHRISTMASTIME with GENE AUTRY will help his friends everywhere enjoy the real spirit of Christmas. This Album has complete continuity from the opening song to the closing medley of Christmas Carols, and Gene’s warm and sincere narration makes one feel that he or she is really celebrating Christmas with Gene. It was produced with the idea of pleasing children of all ages as well as adults. The material has been carefully selected and varies from novelty Christmas songs to the carols which for many seasons have represented the more serious side of Christmas. Here, too, is your old favorite, RUDOLPH, THE RED-NOSED REINDEER, one of the most popular Christmas songs of all time with which Gene has been so closely identified, telling its appealing story of the neglected little reindeer who “made good.” HERE COMES SANTA CLAUS is traditional in its own right and gaily expresses the anticipation and joy that is the Yuletide heritage of every child. The Tinkle of SILVER BELLS and SLEIGH BELLS an the treatment accorded JINGLE BELLS with a fourteen voice choir and full orchestral accompaniment is indeed unique. UP ON THE HOUSE TOP and SANTA CLAUS IS COMING TO TOWN are two of the better known Christmas novelties of the past few years which could not be omitted from this collection. The finale is the story of the nativity in song, a medley of O LITTLE TOWN OF BETHLEHEM, SILENT NIGHT and JOY TO THE WORLD. O LITTLE TOWN OF BETHLEHEM sets the scene for the birth of the Christ Child, SILENT NIGHT describes the holy night when He was born and JOY TO THE WORLD is the musical expression of the true meaning of Christmas. This album is out of print and sold out.